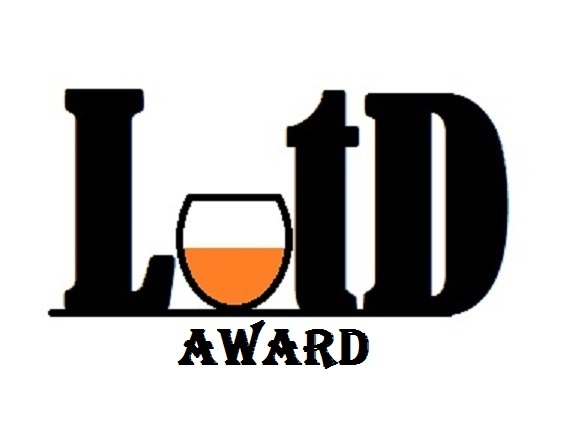 January 5, 2015 Bryan Roth11 Comments on The Definitive ‘Best Beer of 2014’ List. Really. Kind of. The Definitive ‘Best Beer of 2014’ List. Really. Kind of. The flip of the calendar means many things: a fresh start, new resolutions and most important, an end to all those “best of 2014” lists. Surely you’ve now read about where your favorite movies, TV shows, books, podcasts and celebrities rank in order of something wonderful or awful in 2014. But for the subjectivity that is necessary to form each of these, is there any kind of (slightly) objective consensus that can offer a clearer view? While movies, TV shows and books are uniformly released across the country, beer is not. Everyone in the U.S. can see The LEGO Movie at the same time, if they wish, but as a product, beer doesn’t offer that opportunity. In addition to distribution restrictions, many best beer lists gear toward locally-produced brews. At a time of 3,000+ breweries, this certainly makes sense, especially for regional newspapers or other outlets. But that doesn’t mean we can’t try to find 2014’s best beer or best brewery. In fact, it’s easier than you think. Inspired by a recent post on FiveThirtyEight.com that sought to highlight critical consensus for “best of” lists, I’ve found a series of 2014 “best beer” lists from a variety of sources, from blogs to newspapers and prominent magazines like Wine Enthusiast and Draft Magazine. Criteria for selection was simple: a list had to focus on 2014 releases (new beers or new, annual brews) and on widely regional or national distribution. There are more city/state best beer lists than we could shake a pint glass at. That left me with 10 easily-found lists that ranged in ranking from seven to 25 beers. In all, there were 170 total beers to analyze. 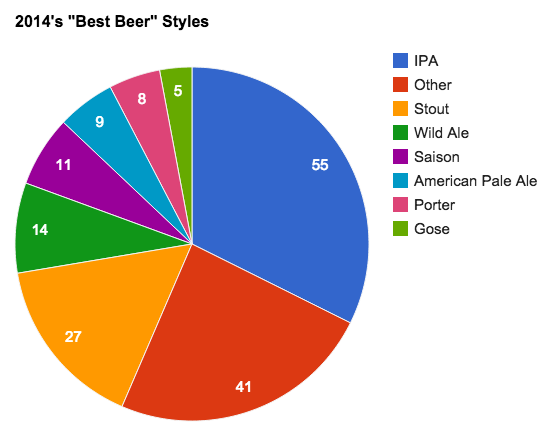 To start, here’s the number of styles represented from the lists. For simplicity’s sake, I included beers like Founders The Dissenter (India pale lager) and Troegs Nugget Nectar (“American amber”) with IPAs. Stouts include all varieties like milk, imperial, etc. The “other” category includes a lot of styles with one or two showings: blonde, marzen, lambic, rauchbier, etc. Please take this with an obvious boulder of salt. There are lots of amazing breweries that certainly aren’t represented in these lists, including your personal favorite from down the road. That said, there are several breweries that stood out from the rest. Others worth noting include Wisconsin’s New Glarus with three beers across four lists (Oud Bruin, Raspberry Tart and Scream) as well as Allagash (Saison/Farm to Face) and The Bruery (Black Tuesday/Mocha Wednesday), which were recognized four times. Should we be surprised that one of the most-cited beers of all these lists is a Session IPA? Congrats to Firestone Walker’s Easy Jack, which was listed three times across these 10 lists, the same number of times as Founders’ Dark Penance (DIPA/black IPA), Stone’s Xocoveza Mocha Stout (imperial stout) and Allagash’s Saison. Also worth noting is Ballast Point’s Sculpin, which was named three times, twice for its grapefruit variant. Now, you’re probably thinking being named three times across 170 beers isn’t impressive, but you should consider that finding any commonality for these lists should be rare in the first place. While we can be subjective about the best movies and TV shows of 2014, we’re all still watching the same ones. There are literally thousands of options that could have been applied to these lists instead, so when we have a little over 140 different beers appearing across 170 total picks, it’s pretty good. One quirky pick was a “salted” stout. Breakside’s Salted Caramel Stout was picked once, while New Belgium’s Salted Belgian Chocolate Stout showed up twice. Will Gordon at Drunkspin had the only list that didn’t include a stout of any kind. He did have a pumpkin ale, however. Like Founders’ “Most Americanized Portfolio” title, the same can be said about Todd Shaner of New Jersey’s Cherry Hill Courier-Post. He ranked 40 total beers, but in his top-25 I considered for this, he included 10 IPAs and seven stouts. In their “best beer” list, the sages at Draft Magazine included a cider: Seattle Cider’s Gin Botanical. In addition, the largest variety of beers came from Draft Magazine and Wine Enthusiast. Not only did they each have a more randomized variety of styles, they also had a much lower average ABV among their choices at 6.3 percent (Draft) and 6.2 percent (Wine). The average across the other eight lists was 8.2 percent. The highest average ABV among any list went to Will Gordon at 9.2 percent, but that was heavily skewed by a selection of Sam Adams Utopias, which clocks in at 28 percent. Todd Shaner at the Cherry Hill Courier-Post and Dan Murphy at Milwaukee Magazine both had average ABVs of 8.6 percent. This was Paste Magazine’s second “best beer” list of 2014 – they also crafted a list in July. The only beer to make the cut from July’s list to December’s year-end countdown was Half Acre’s Heyoka IPA. Questions? If there’s anything I didn’t cover, ask away below and I’ll try my best to answer from what I discovered! Thanks for this post! This was extremely interesting! 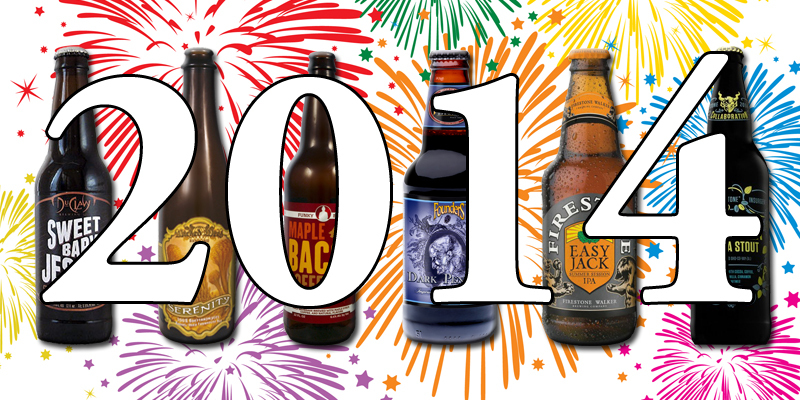 Happy New Year and cheers to trying to find the best beers of 2015! It’s a never-ending search. Thanks for reading! Glad you liked it.